Think the weather was squirrely last week in the Wood River Valley? 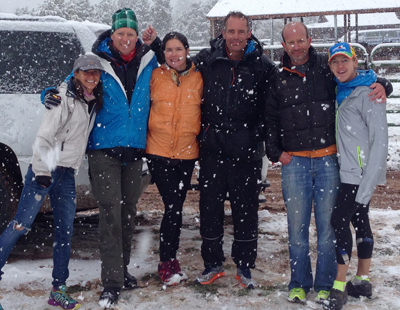 Just ask the Team Wicked Spud relay runners about the extreme weather in southern Utah last Friday. Wicked Spud was among 350 teams and nearly 3,000 individual runners committed to run 128 miles in relay format for 22 hours. They ended up finishing nearly 100 miles. That’s because rain, snow, freezing temperatures and dangerous trail conditions forced the cancelation of the race for all teams after 100 miles and 18 hours of running. Fortunately, all runners on the Ragnar Trail Zion relay course were safely extracted from the rugged and steep desert trails in the early morning hours at Zion Ponderosa Ranch. The team of six Wood River Valley runners included Nancy Mann, BJ Blair, Sonya Wilander, James Gillespie, Leigh Everitt and Mike Wolter. Total course distance was 128 miles comprised of three loops, 3.1 miles, 4.6 miles and 8.2 miles, boasting spectacular views of Dixie National Forest and Zion National Park. It was the second relay event for the Wicked Spuds. In 2011, the team completed a 180-mile road relay in southern Utah in just under 30 hours. With a commitment to leave no trace, the Ragnar Trail Zion was the event’s first zero-waste event, including recycling, composting and reducing items used. Ragnar Trail Relays are naturally-inspired overnight running and camping adventures that make testing limits a team sport. In 2014, Ragnar will host seven trail events across the country.